The International Tourist Trophy may well be the most prestigious race that you’ve never heard of. The term Tourist Trophy, or TT for short, has become synonymous with motorbikes and the Isle of Man. But right up to the 1950s, it was the biggest prize in any motor racing formula. 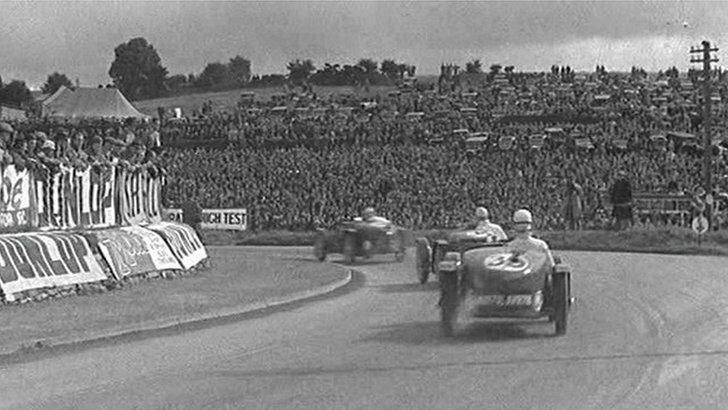 What’s more, the race was a regular fixture in Northern Ireland, attracting up to half a million spectators at its peak and captivating the world’s media. The TT was originally created by the Royal Automobile Club (RAC) and was first awarded in 1905. It is still presented to this day, making it the longest running trophy in motorsport history. Northern Ireland’s association with the TT started in 1928, when the decision was taken to host the event over a near 14 mile course made up of closed roads, linking the towns of Dundonald, Newtownards and Comber. The agreement to hold the race in Northern Ireland owed much to the influence and enthusiasm of Harry Ferguson, (who later would revolutionise tractor design) and a man called Wallace McLeod. The intrepid pair had visited Brooklands race circuit in England the year before and convinced the competing drivers to come to Ulster to test their skills. And come they did! To give this massive coup a sense of perspective, winning the TT was more important than Formula 1. Every major car manufacturer who wanted to prove their worth entered the TT, including Bugatti, Bentley and Mercedes-Benz. In fact, it was common place to design dedicated models to compete in the race, like the aptly-titled Aston-Martin Ulster. One of these cars is set to be auctioned in June 2015 and is expected to sell for over £1.6m. The race was a grueling test of endurance, lasting six hours. The pits and starting grid were located on the Newtownards Road, Dundonald. From there, the cars would launch themselves towards Newtownards via Quarry Corner then up and over Bradshaw’s Brae and into Conway Square. The track then swept through the County Down countryside, on to the small town of Comber and back towards Dundonald. Drivers had to contend with blind bends, high hedges and stone walls. If that wasn’t enough, the track crossed over and under the Belfast-bound railway line, which also carried the multitudes to see the action. As the race grew in stature, the competition between teams intensified and the cars became faster and faster. In a nod to safety, supercharged specials were banned. However, despite these efforts a tragic accident occurred during the 1936 event. Jack Chambers, driving a Riley, lost control on Church Street, Newtownards and crashed into the crowd. The accident claimed the lives of 8 spectators and injured 40 others, 18 of them seriously. The decision was taken not to run the race again. Perhaps it was intentional that scant evidence remains of this once glorious circuit; the roads offer little indication of their illustrious and infamous past. A plaque on Castle Street in Comber commemorates the legendary butcher’s shop corner and appears to be the only pointer left to this bygone era. Remarkably, the TT returned to Northern Ireland in 1950, at Dundrod. Like the Ards course before it, the Dundrod circuit was comprised of pubic roads. In fact, the circuit which is used today for the Ulster Grand Prix motorbike road races has changed little from its sportscar beginnings. 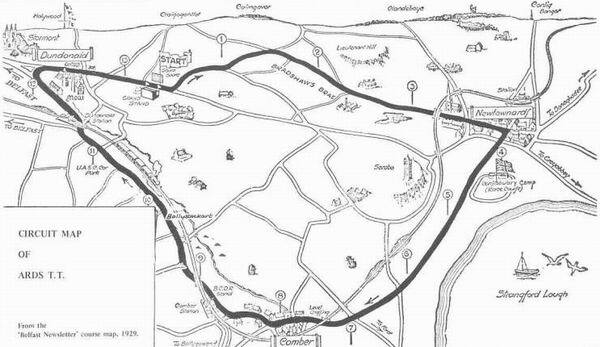 At 7.4 miles, Dundrod was only half the length of the Ards track. However, it was still no easier. At the height of the race’s popularity, competitors would attempt 84 laps, reaching speeds of up to 170 mph, in order to get their hands on the still-glamorous prize. Grids of 50 plus cars were the norm, which included factory supported teams from Ferrari, Maserati, Jaguar and MG. The world’s best cars required the world’s best drivers. 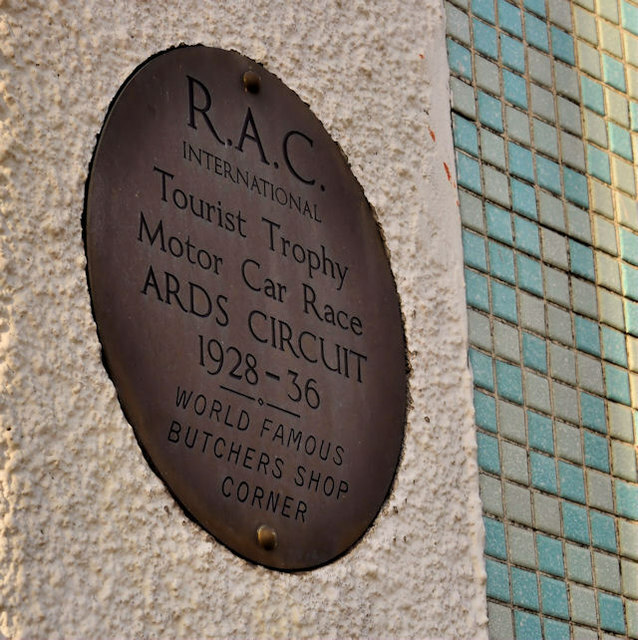 Stirling Moss and Juan Manuel Fangio were regulars at the County Antrim venue. Dundrod offered drivers a unique and unmatched challenge. The heavily cambered rural roads were designed to maximise water rainwater run-off, rather than high speed cornering. Drivers could be caught out quite easily by the crests, dips and inconsistent surfaces. There was little or no margin for error. The 1955 World Sportscar Championship had been shrouded in disaster long before the series reached Dundrod in September. A crash at Le Mans, involving one of the leading Mercedes-Benz machines, lead to the death of 83 spectators as well as the driver, Pierre Leveigh. Unfortunately, the outcome of the Dundrod TT was no less catastrophic. When that year’s race started, it was warm and dry; but the unpredictable Northern Ireland weather intervened. Rain fell and havoc ensued. Jim Mayers, driving a Cooper-Climax, was caught out near a section known as Deer’s leap and hit a concrete pillar. His car exploded in a ball of flames and he died instantly. The explosion disorientated the driver of the following car, William Smith, who then hit the car of Mayers. He too, died. The race continued, regardless and the rain still fell. On lap 35, another driver, Richard Mainwaring, lost contol of his Elva-Climax and the circuit took another life. The race was eventually won by Sirling Moss, who passed Mike Hawthorn’s broken Jaguar on the last lap. However, it had become obvious, yet again, that the uncompromising Ulster roads were too dangerous for cutting-edge race cars. The heyday of the TT in Northern Ireland was over, this time for good. Fascinating, I had no idea there was this much motoring history on my doorstep! I didn't know about the Ards TT but there was an article about Dundrod in Evo one time. Great write up, this new section of RMS has unleashed some good writing! I was lucky enough last week to get a look around an unrestored MG K3 Magnette that won numerous Ards TTs, raced in the Mille Miglia and all of the great British tracks of the day. Mawhinneys Butchers on the corner in Comber has I think lots of black and white photos of the TT as it is on the old route, fascinating stuff imo. Evo magazine tested two cars a few years back at the Dundrod circuit, an XKRS and an SLS AMG if memory serves. Had it not been for that article, I'd not have known about those races. Excellent article, really enjoyed reading that. Cheers for the kind words, chaps. Northern Ireland has some amazing history when you scratch a little! It's amazing to think that the likes of Moss in the Mercedes-Benz 300 SLR as well as Fangio and Nuvolari raced the roads here. The cars drove up to Dundrod circuit from Great Victoria Street via the Grosvenor and Springfield Roads. The traffic was stopped at the junctions to allow the race cars through and avoid them stalling. The only difference between the circuit then and now is the location of the Hairpin bend, now the Lindsay Hairpin but previosuly was the tighter turn a few 100 feet down the B38. To think they did 170mph on that course in those days is absoluely nuts. I have a friend who as wee boy managed to get Fangio's autograph outside the hotel at Gt. Victoria St Station.